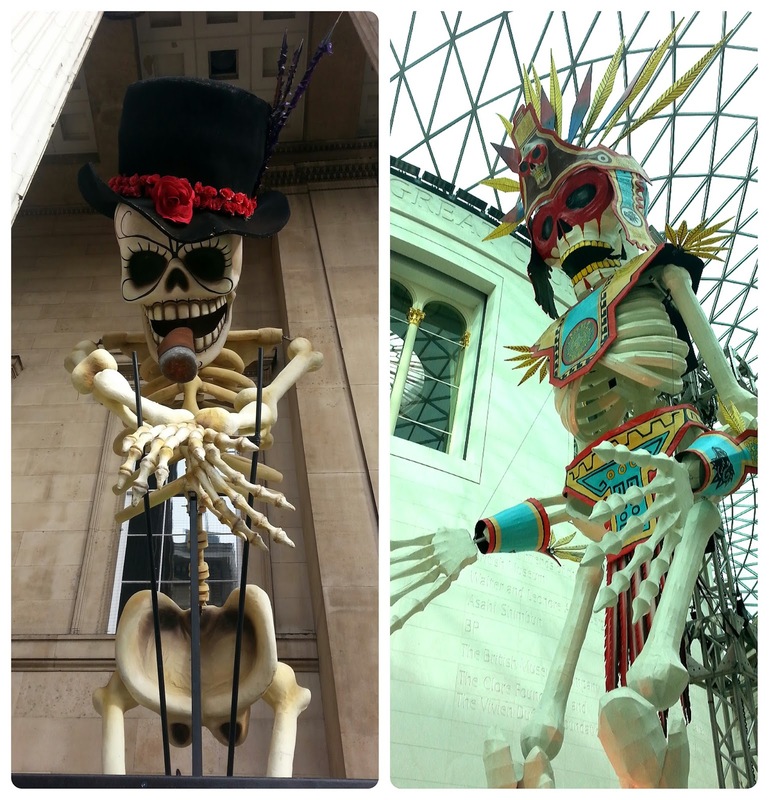 Alright so not strictly true but when you turn up at the British Museum for the next few days you are welcomed by giant skeletons. 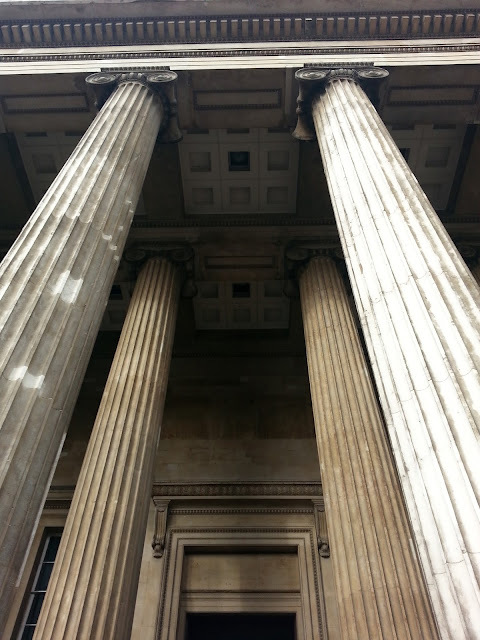 It was a dull but unseasonably warm day in the capital and gave us a chance to visit probably London's most treasured attraction, The British Museum. With M and K in tow it was bound to be on the one hand hectic and on the other enlightening. Taking kids to major museums gives you a whole new perspective on looking at exhibits. Often its quick but you learn to take as much in as you can in your brief time there. The British Museum seems to me to be in a rather curious location. Beyond Tottenham Court Road and close to Holborn. Hidden behind shops, offices and houses. It almost appears out of nowhere. All grandiose and ancient looking. 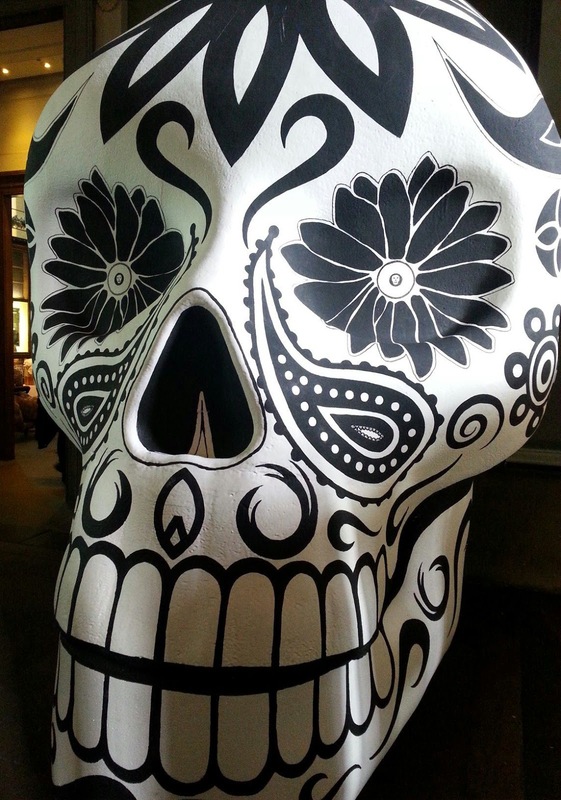 It just so happened that today was the start of the Days of the Dead exhibition. Giant Skeletons welcome you and are featured along with other exhibits throughout the museum until 4th November..so hurry hurry. It was surprising but very welcome. The kids loved them. M wanted to start in the Japan section. Well it is on the top floor and seemed a logical way to work downwards towards the other areas. So there we started, having negotiated the grand hall. A wonderful area full of vibrancy, coffee shops, displays and children's activities. We headed up to the top floor, wandered around the Japan section, prints and ceramics featuring strongly. Then onto the Egyptian section. Probably the most popular in the museum. Busy, busy, busy. M and K were then hungry, aren't kids hungry all the time? So we headed out, past the skeletons to a small Korean restaurant, Bi-Won in Coptic Street. Highly recommended. It's only 5 minutes from the museum. So a great lunch or dinner stop. It's not all about the Mummies! A delicious lunch was soon munched and then we headed back. The British Museum is a maze and doing it in bite sized chunks is a great way of looking around, especially with kids. So we headed to see the Romans and Greeks. A map is perhaps advisable as its easy to get lost in the labyrinth of corridors. Again you wonder around with a sense of amazement at the complexity of the displays. Its such an eye opener. This is a museum that will delight young and old. Ok it doesn't have the hands on approach of the Science Museum where you can touch buttons and see things working. What it does give you is a grand sense of our planets amazing history. Just how different each age and continent were. How amazingly clever and talented they were too. 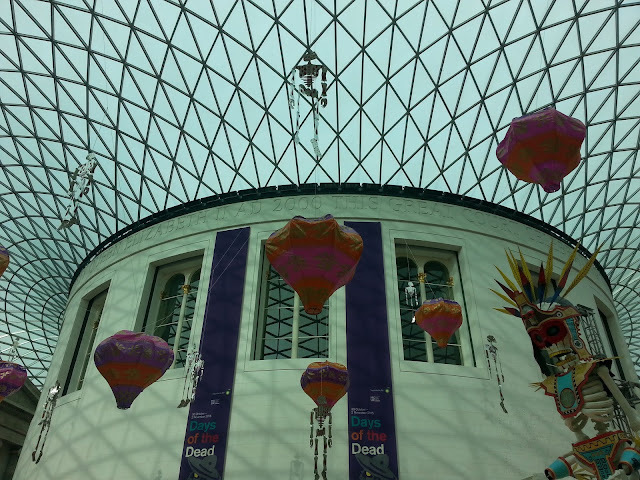 I would go as far as to say that the British Museum is the creme de la creme of museums in London. It's where you should really start your grand tour if visiting the capital. Judging by the vast numbers that seems to be the case. It may ask for a £5 donation but this is a museum that delights every time you visit and is worth the money. A true gem. Have you been to the British Museum? Did you enjoy your experience? If so please let us know via the social media buttons. As always thanks for your support and happy museuming!